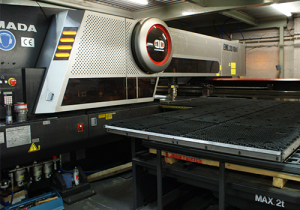 Considerable investment has been made in the latest Amada sheet metal processing equipment. Including, a high accuracy EML 4kw combined laser and high speed punching cell with 3 metre automatic sheet handling, and a Vipros punching cell, both with lights out operation. This technology provides capabilities for in-cycle laser cutting, high speed punching, forming and threading, all in one set-up.